New month, new monograms! Spring is finally here and we couldn't be more excited about blooming flowers, warmer weather, and spring weddings! If you've been searching for a new clutch or evening bag, you have to see our new collection of box clutches! They are perfect for any occasion and under $75! Add a classic touch to any outfit with our new Monogrammed Box Clutch. This personalized clutch measures approximately 7 inches wide, 4.25 inches high, and 1.75 inches deep. Featuring a gold clasp, this adorable clutch also comes with a removable gold crossbody chain. Complete your look with a cocktail dress some strappy sandals and you'll be ready for date night! This Monogrammed Wrapped Clutch can be carried as a clutch or a crossbody. Available in black and ivory, this classic clutch has beautiful gold accents and features a gold foil monogram. 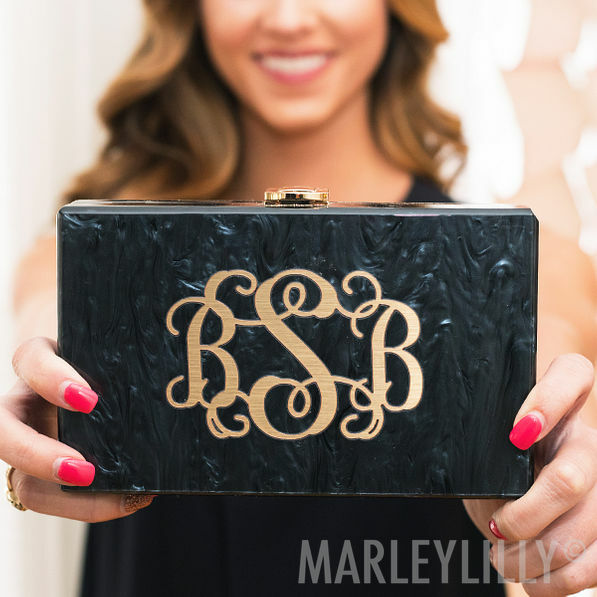 This monogrammed clutch measures approximately 8 inches wide, 5 inches high, and 2 inches deep. It also comes with a removable gold shoulder chain that measures approximately 48 inches long. This sturdy and durable clutch would look great with your favorite casual outfit or cocktail dress and heels for a night out on the town! 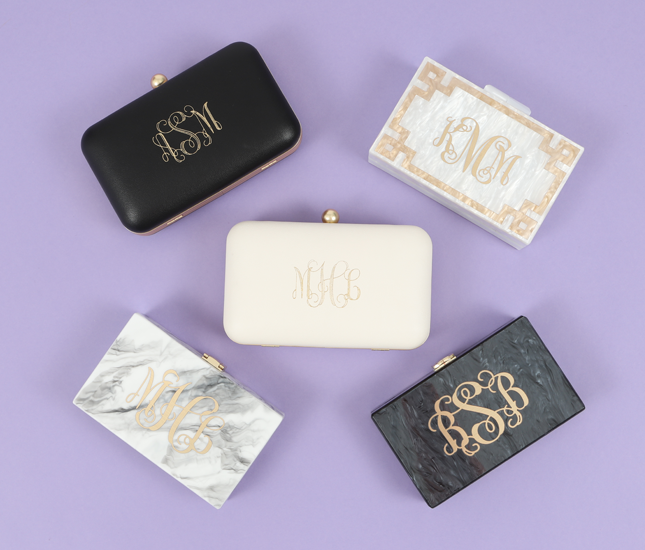 Carry just the essentials with this classic Monogrammed Inlay Box Clutch - throw in your iPhone, lipgloss and wallet for the night! This monogram clutch measures approximately 7 inches wide, 4.25 inches high, and 1.75 inches deep and features a magnetic clasp for closure. It also comes with a removable gold shoulder chain that measures approximately 48 inches long. What's your FAVORITE for Spring? Comment down below!